Keeping on top of the latest research and trends is still a huge challenge. That's where Digital Intelligence can come in - every month we trawl through hundreds of websites, magazines and research newswires to bring you this retrospective review of the industry's growth and the evolution of digital marketing. Let us take some of the strain and make your email that little bit faster to sift through. And if we've missed something you'd like to know more about, then just email us right back. Deep insights about marketing to teenagers from new US research about the media consumption of teenagers. The implications for marketing to teens are that TV and magazines continue to account for very high levels of time, alongside digital channels. It also suggests that in the US online use is often higher for slightly older segments where it becomes a key business tool. Fascinating insights and an important dose of reality for brands thinking about digital-only strategies. There is a marked increase in the number of people choosing to consume different media simultaneously, confirming the evolution of media multi-taskers according to new research from the European Interactive Advertising Association released in June 2009. The study highlights how consumers are entering a new phase of communications and commerce online and how dual simultaneous media consumption has become standard consumer behaviour. A number of interesting articles about ICT expansion and empowerment across Asia were featured in the first edition of Asia Research News - a ResearchSEA publication to highlight research in Asia. What are the media consumption habits of the average American? What are consumers saying about when, where and how they use media? Which target audiences can be reached and engaged online? How does online complement offline media? What are the implications for media, advertisers and marketers? This paper from Ball State University is the summary of a media diary study that tracked the experiences of 15 US teenagers in 2007. It’s a fantastic insight into the step-change in media consumption, showing in detail the nature of media saturation and the switching between channels. It provides a snapshot of the explosive growth of influence the web is having in consumer behaviour, and also tracks the changing locations of internet access, clearly showing the importance of media consumption on the move. The academic methodology is reassuring and whatever market you are exploring, this provides a benchmark for the nature of change. The Hitwise UK Annual Online Performance Awards serve up a list of best in class category winners for website traffic throughout 2007. Published this month, the Hitwise team collate data and compare across a large number of services in the same category. What's interesting is that it's the dotcom pureplays who steal the show, nudging out the newspapers, magazines and broadcast media brands that compete in key industry sectors. This is a ranking of the percentage of user visits a UK website received between January and December 2007. As Hitwise reports on the anonymous online usage and search behaviour of more than 8.4 million UK Internet users (the largest online sample of its kind) the data is solid by virtue of the volumes. Staggering to reflect on, but half of the UK’s single population are now logging-on to dating sites. That’s the latest finding from web dating specialists Parship who reckon almost eight million Brits tried online dating last year, an increase of around 50% on 2005. The gender balance is pretty even (52 per cent of men vs 48 per cent of women use online dating). Parship’s UK and Ireland director Tony Blin Stoyle sees higher rates among older people: "UK singles, particularly those aged 30 to 40, recognise that as they get older and their social networks become smaller, they need to maximise their opportunities in order to meet a partner. if you rely on traditional routes and wait for a chance encounter with someone special, you could end up waiting a very long time." January 28, 2008—More than 85 percent of the world’s online population has used the Internet to make a purchase—increasing the market for online shopping by 40 percent in the past two years—according to the latest Nielsen Global Online Survey on Internet shopping habits. Globally, more than half of Internet users have made at least one purchase online in the past month, according to Nielsen. 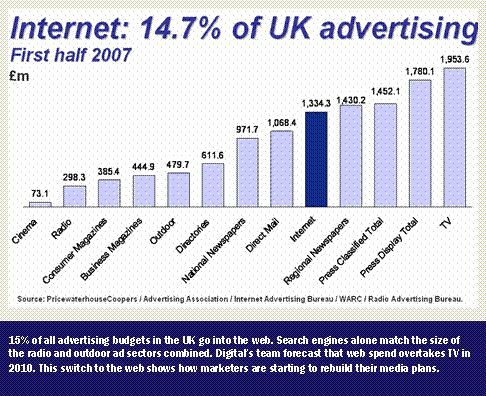 The 2007 data for online marketing spend shows another giant leap in the growth of web advertising as more and more brands switch their budgets over. By looking at the market share of the web vs other media, it's easier to gain the context about how great the changes are in the media mix. For more information see the Digital Insight Reports at www.DigitalStrategyConsulting.com/insight. Dynamic Logic releases new analysis of 32 cross-media campaigns* across ten categories showing that media work best when used together. All three media platforms – television, magazines, and online – contribute incrementally to brand metrics, but at different levels, bringing various strengths at different points along the purchase funnel. TV and online's contributions were more apparent during the awareness stages while magazines were stronger at building brand favourability and purchase intent. These findings are consistent with results from an earlier analysis conducted by Dynamic Logic in 2006. Blogging has moved from the fringes of the web to the mainstream. Over the last few years, collectively audiences have swelled, and this download of data from Digital's friends at NetRatings, you can see the latest traffic numbers for some fo the key blogs and platforms. comScore, Inc. (NASDAQ: SCOR), a leader in measuring the digital world, today released the results of a study using its comScore Segment Metrix tool, which showed that heavy U.S. visitors to social networking sites are significantly more likely than average to visit leisure-oriented retail site categories, such as music, jewelry/luxury goods/accessories, consumer electronics and apparel. Heavy social networking visitors are defined as the top 20 percent of visitors based on time spent on social networking sites. What form of advertising works best? That’s a question you’re always asked in the digital marketing industry, and every genre of websites have their own research to help you with the answer. But new insights from the OPA in the US are firming up exactly how much more impact video gives to campaigns, and why placing them inside content-rich destination sites adds further value still. Central and Eastern Europe's Internet economy grows rapidly, with national online businesses standing shoulder to shoulder with the world's giants. With Internet penetration on the rise and more being spent on online advertising, digital enterprises are set for a new boom - although the pace and scale of these changes vary greatly from country to country. This first edition of the Digital Central and Eastern Europe tracking study draws a picture of the industry today. Online or virtual communities have fast become the must-have component for every website. Media groups are shifting their strategies, and placing people at the heart of communication rather than at the end of it. Many corporate online strategies are centred around online community: from the eBay trading community, to dating in Match.com, to the child-safe world of Habbo Hotel. The boom in online communities is unstoppable as the internet becomes more deepseated in our day-to-day lives. What is an online community? Which communities are working? Who is benefiting from them today? How do they support your marketing strategy? How effective is advertising in digital environment? Many asked about it and here is a piece of research which answers this questions. If you would like to know more about how to evaluate the effectiveness and efficiency of online advertising, not in isolation but as an integrated component of the marketing mix, reading of this study is a must. The revolution in direct marketing continues as more firms realise the power of search. Search engines account for half the online advertising industry in some countries and theyre changing the nature of customer acquisition marketing forever. Now Central and Eastern Europe are heading towards their tipping points in the growth of search, and with the engines continuing to deliver waves of new products and tools, its clear the growth will not slow down. Online advertising is changing the nature of marketing. This is happening across the world, but here in Western Europe we're seeing some of the trends that will eventually spread worldwide. The eighth edition of the Digital Europe tracking study provides extended analysis, commentary and deeper insights about how this exciting industry is changing. In our latest podcast feature Richard Eve interviews Danny Meadows-Klue about the study and asks where the industry is today and where it is heading. Internet communications have become a routine part of the daily lives of most people in the technically advanced countries of Asia, Western Europe and North America. As part of this, online marketing has already become a mainstream part of the media mix. These facts and landmarks we collated for participants on the Digital Training Academies are a summary of the internet and marketing development Academy lectures and are intended to present a few highlights of the immense changes created through this industry. This report tracks the take-off of online advertising since the mid-nineties and forecasts its rise to become one of the dominant media channels for marketers within the next three years. It predicts online will exceed £2bn in 2007 and quickly consolidate a market share comparable to national newspapers. It outlines some of the key drivers and suggests the role of search will become even greater. to increase the odds of finding the optimal media mix to achieve marketing success. This study compares media contributions from different channels in the drive to purchase. “Word of mouth” is a hot topic in marketing these days. Indeed, in DoubleClick Touchpoints, their annual survey of online consumers, they have routinely seen respondents select “word of mouth” as a key factor that influences their purchase decisions across most product categories. But, aside from sending your product to your hundred favorite bloggers, how can marketers efficiently spend marketing dollars to influence word of mouth? That was a key question the authors of the report set out to answer in our 2006 DoubleClick Touchpoints IV survey. The hype about Web 2.0 often obscures the practical benefits of this set of technologies, applications, and concepts. Development teams have begun using Web 2.0 user interface technologies, service-oriented architecture (SOA), and Social Computing features to create sometimes startling consumer applications. But few have yet applied these ideas to enterprise applications in more than trivial ways. When they do, application development professionals will find that Web 2.0 describes the transition of the Internet from flat, static, standalone Web sites into a participative, adaptive, consumer-centric medium. Snappy Web 2.0 user interfaces are the starting point, but capitalizing on Web 2.0 will require Agile development processes and a sharp focus on service creation, application assembly, and community-based development that most IT shops do not employ today. The path to Web 2.0 for enterprise apps won't always be clear, but the technology offers big rewards, including committed customers, more productive employees, and empowered communities that increase the rate of innovation around corporate assets like products and historical data. Each visitor to a website is at a different stage in their relationship with the brand than the next visitor, and understanding and using this knowledge is critical in getting the best response and generating the highest ROI from your online marketing spend. If a web marketing platform can’t identify the stage in the sales cycle of each visitor, the website will continue to miss golden opportunities at converting and retaining warm prospects and customers. By successfully implementing the concept of RedEye’s e-Loyalty Ladder, you will be able to identify and correctly categorise your web visitors into a segment, and then communicate a highly targeted dialogue with them. The vast majority of Web sites still use IP-Based server logs to analyse web usage. It is commonly recognised that IP-based tracking systems are the least accurate and so some companies who require more robust MI have turned to cookie based systems. Clients require robust data to enable them to create more profitable customer relationships by getting more customers spending more money, more often. RedEye has developed technology to overcome this problem which also allows them to measure the accuracy of IP and cookie systems by comparing them to a known set of data. The results from those comparisons are published for the first time in 2003. The study is based on analysis of two of the UK’s largest ecommerce web sites, www.asda.com and www.williamhill.co.uk. The results are staggering: The IP-based approach overestimated unique visitors by up to 7.6 times in a single month while a Cookie-based approach overestimated unique users by up to 2.3 times in the same period. These studies with The Henley Centre have given rich insights into the way consumers are influenced by what they see online. They paint a picture about the online strategies that create brand loyalty and brand trust and how the internet is changing consumers’ attitudes to brands. There are also insights into what marketers and advertisers can do.